One student, 18-year-old Wanye Evan Brown, was arrested and charged with numerous weapons-related charges, disturbing the peace, having a weapon on school property, and burglary. A report from one student that another student discharged a gun at a bus stop led to a Code Red lockdown at Boynton Beach High School Friday morning and the arrest of two students, according to the Palm Beach County School District. 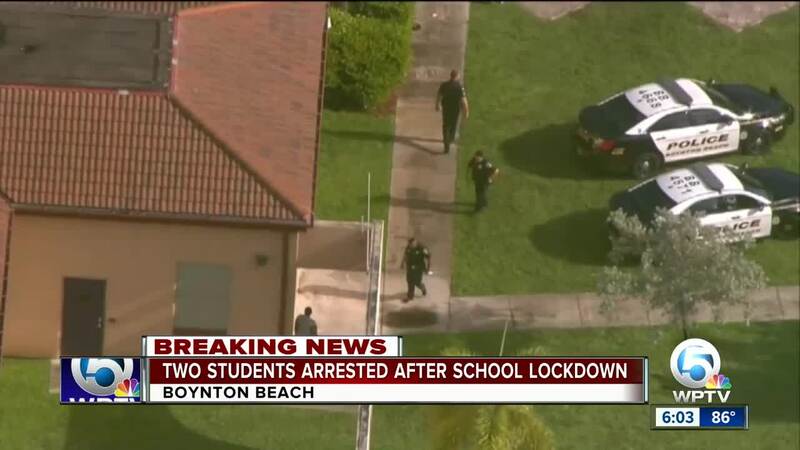 When they learned about the report, Boynton Beach police assisted School District of Palm Beach County police in searching the campus at Boynton High. Trained gun dogs were used and students at the bus stop and on the bus were interviewed, the district said. Another student was also arrested. That student has not yet been publicly identified. Code Red lockdown at BBHS has been lifted. @SchoolPolicePBC investigating. We are assisting them. Some parents went to the school when their children texted them that the school was placed on lockdown. Chopper 5 flew over the scene and spotted multiple police cars parked outside the school. Parents who were waiting outside the school were allowed to sign their kids out. Once the lockdown was lifted, they were able to take them home.